Why not try growing some Asian vegetables in your garden this year? Most of these vegetables will grow almost anywhere and the seeds are readily available from several seed companies. The varieties that I am listing can be purchased from Evergreen Seeds, Kitazawa Seed Company, and other online companies, so the seeds are easy to purchase. Many of the herbs and vegetables you will be familiar with and some we already grow in our gardens, such as basil. You will find different varieties of plants that aren't normally grown in the US and you'll find vegetables that you haven't heard of before. Most are easy to grow and some grow very quickly. Some of the varieties are the first vegetables you'll harvest in the spring. Use them in stir fries, greens for salads, mix them with your favorite rice dish and use for your favorite Oriental dishes. 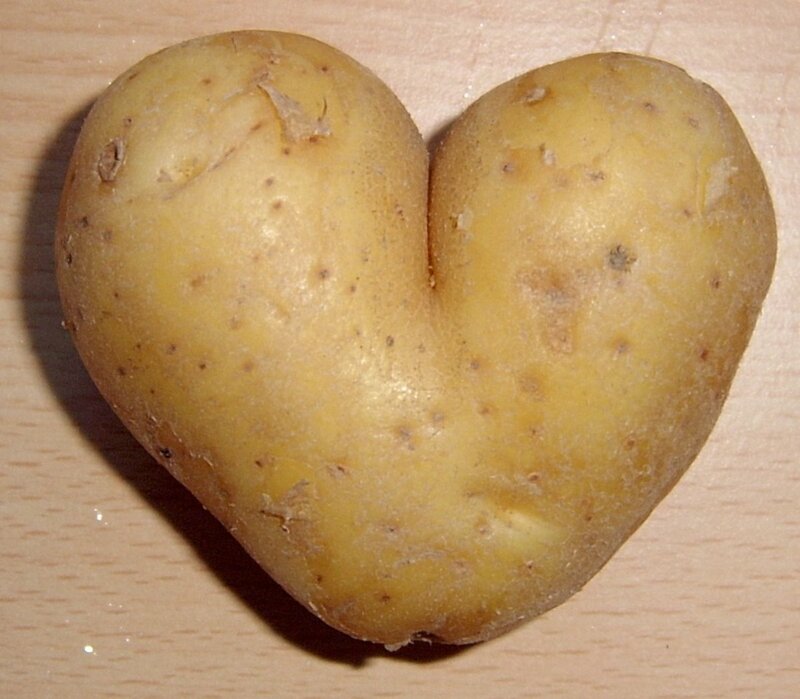 Next time you visit a Chinese or Japanese restaurant, if you taste a vegetable that you especially enjoy, ask what it is. You may be able to grow it yourself. Edible Amaranth - This is also known as Yin Tsai, Chinese spinach, Een Choy, Hiyu, Tampala, Hin Choy, or Amaranth Spinach. A vegetable amaranth is different than the grain one. It requires heavy watering. The greens are well worth growing, because they don't go to seed in the heat. They don't get bitter like other greens and they don't wilt. They will reseed themselves and you can use them all through the summer, spring and fall. They can become invasive though because of this. Eat it steamed with lemon juice. Adzuki Bean - This is a red bean that is grown in both China and Japan. It is known in Japan as an Adzuki Bean, but in China it is known Chi Dou. It is popular in Japanese soups. Broad Bean - This is the fava bean that is raised in China, Japan, India, the Philippines, and Thailand. Green Beans - Many of the green beans that are grown in Oriental countries are the same beans that we grow here and I won't mention the ones that are so popular that you will already recognize them. The ones I haven't heard of before are Alicante and Kwintus Pole bean. Alicante is a French-style green bean and Kwintus is a Romano type bean. Mung Bean - This is a bush type bean. Beans used for sprouts in the Orient are usually Mung Beans. The seeds are green or yellow. These beans are picked and cooked like any shelling bean. Snow Peas - I think that everyone is familiar with Snow Peas. You pick the pod before the peas inside have developed. These are good alone or in stir-fries. Yard Long Bean - These have been sold for awhile in the US, but I didn't know that there are as many varieties available. You can purchase these at almost any place that sells seeds now. 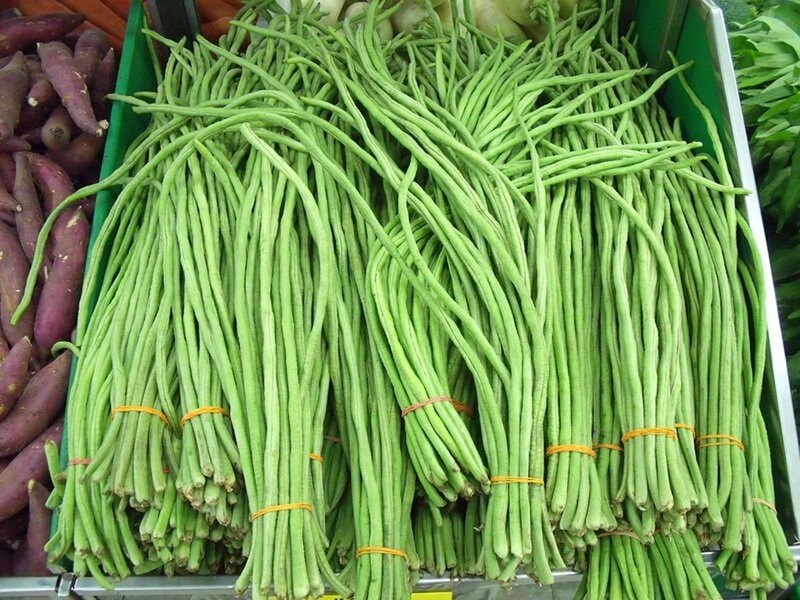 They are called yard long beans, because they grow about a 1 1/2 feet long. I let them grow longer and they were too tough at that stage. Calabash Gourd - It is also known as OPO or the Bottle Gourd. The gourd is picked when young and used like squash. If you let the gourds mature they become hard and can be used as a drinking glass. In warm areas, the plant is a vigorous climbing vine. If you let different varieties mix, they form all sorts of new shapes. Because these gourds have a hard shell, it could be fun to see what you can use them for later. Winter Melon - This is also known as the Wax Gourd or Tung Qwa. These melons grow on vines like pumpkins and can get as big as 50 pounds. You can store them like winter squash and eat them in the winter. Winter Melon is cooked before eating. Garland Chrysanthemum - These are also called shungiku and choy suy. These give a good taste to soups, stir-fries, and sushi. You can also eat the flowers of this plant. Chinese Cabbage - This cabbage is also called Napa cabbage and Celery Cabbage. It is closely related to mustard. The Chinese Cabbage is well worth growing, because it is much milder than the regular cabbages, easier to digest, and are lighter in texture than what we are used to growing. These grow quickly and may used in the same way as you use regular cabbage. To harvest Chinese Cabbage, pull out and cut off the head. You may also use the leaves at any time and just cut what you will use. Always leave at least 5 center leaves. They are good for stir-fries and pickling. Use in Kim Chee or just boil like you would any cabbage. 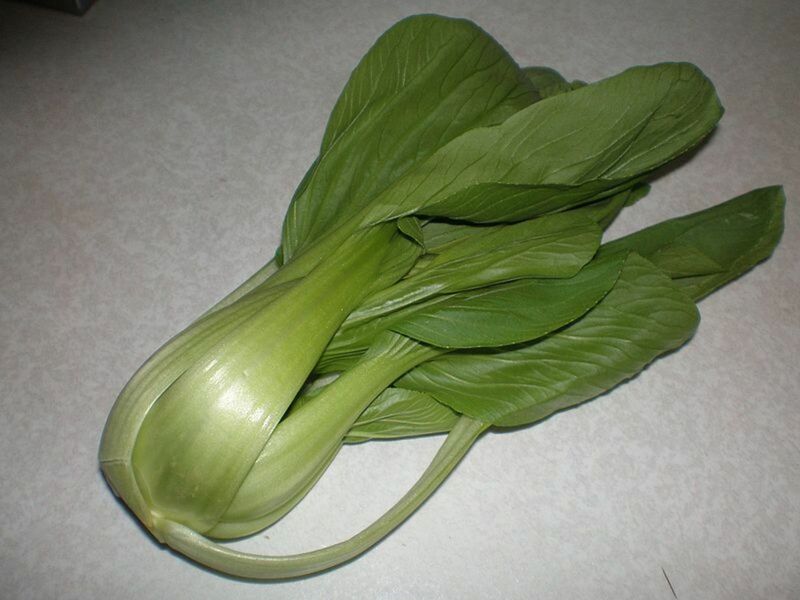 Bok Choy - This is the same as Pac Choi, Pakchoi, and Pak Choi, just different spellings are used. The miniature vegetable is easy to grow and delicious. You will need to plant it in early spring. Use it in stir-fries whole, halved and chopped. Use the young leaves in salads. Mizuna - It is also known as kyona. This mustardy green is a delight in salads. You may use the stems, stalks and leaves. A purple variety is now available to give your salads some extra color. In Carla Emery's book "The Encyclopedia of Country Living", she suggest planting mizuna in the fall months and letting it winter over, because the plant goes quickly to seed in the spring. Once the plant comes up in the fall, you should thin them to about 8" apart. Place a cloche around them for protection in the winter. When harvesting, just use the leaves from the outside of the plant and it will keep producing new leaves. This is a plant that you need to harvest early, because once it goes to seed, you will no longer want to use it. Baby Leaf - This green is good to use for adding flavor to salad dressings. Mustards - These are also known as Mustard Greens or Mustard Spinach. The mustard is usually stronger in taste than our spinach or chard. It also has a tougher texture. Saan Choy - Sann Choy is also known as Indian Spinach, or Land Kelp. It resembles a flowering white cabbage. The plant itself is a beauty and can be grown in a hanging basket as an ornamental plant. It works well as a substitute for spinach in hot weather months and can be eaten raw in salads. This plant needs to be started indoors. Celtuce - This plant combines the traits of celery and lettuce. The part you want to eat are the seed stalk, not the leaves. Use the stalks like you would celery or cooked and served like you would asparagus and serve with sauce. It is also good in a stir-fry. Coriander - Coriander is also know as Chinese Parsley, Cilantro, and Yan Sui. My neighbor grows this in her garden every year and it does well. The plant is an annual that grows quickly if the area has a mild climate. The plant can be used in stir-fries and soups as a seasoning. For this use, just use the young leaves or cut shoots. The Chinese dry the leaves and use both the dried leaves and seeds as a seasoning. Oriental Basil - The difference between the Oriental varieties and the ones found in the US, is that the Oriental has a stronger taste. Stevia is a herb that can be used as a natural sweetener with 0 calories and carbs. Often called Sweetleaf or Sweet Leaf it is has a pleasant red licorice taste. Plan a perennial flower garden that has blooms all season. Learn how to shape the garden. Choose the right colors of flowers, plant a theme garden and more. Find companies that offer their free seed catalogs through the mail. Hard to find seeds and plants are easy to find. Not all Oriental vegetables are included here. Visit the seed companies I have listed, and you'll find many more. Give yourself a taste treat this summer and try something new. This seed company carries almost any oriental seed that you may be searching out. lies15858, I'm happy you liked it. I'd like to grow a few more in my garden, but just don't have enough space. I should grow more in containers. Thanks for reading and commenting. Very good hub of Asian vegetables Barbara Kay, well done. 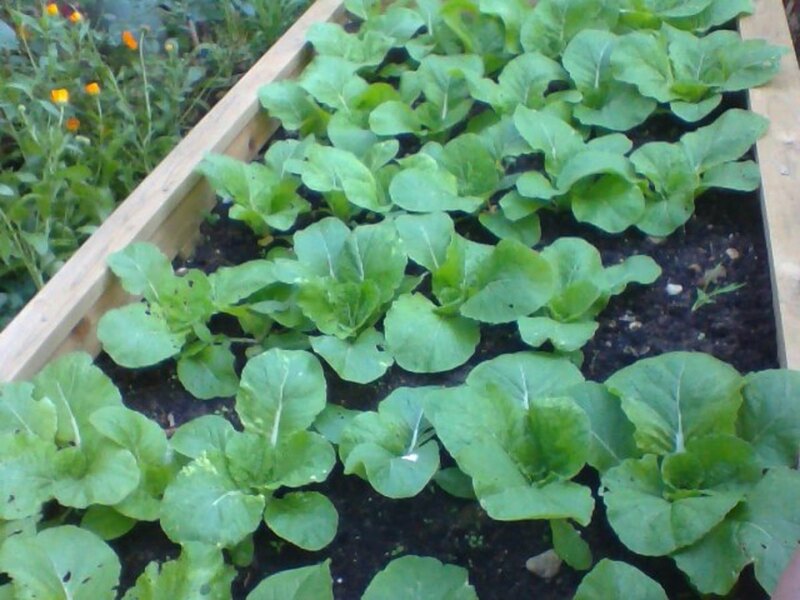 I grow the pak choi and mustard ones, they are delicious and nutritious too. jaswinder64, Thanks for commenting. I hope you are able to try of few of the Asian vegetables this year. Linda Tadlock, Thanks for stopping by and commenting. It wouldn't be any harder to grow them then the vegetables we are used to growing and it might save some money. Being a fan of Asian food, I guess I would enjoy growing Asian vegetables in my garden. Thank you for the great idea. laell8, Best of luck growing your plants in pots. I use to have all of mine on our deck and as long as I used large pots, it worked out just as well as planting them in the garden It was easy to take care of too. Thanks for visiting the hub. This was very informative. Next year I am going to be putting garden plants in pots rather than digging a section of earth...I think I will try some of your suggestions for variety! saif113sb, Thanks for reading the hub. I hope your are able to use some of the information and are able to grow some Asian vegetables of your own. RussellLHuey, Thanks for visiting the hub. Yes there are some interesting Asian vegetables. Charlotte, Thanks for commenting and I'm happy to hear you enjoyed the info. I love some of the Asian vegetables myself. I am Asian, I do so recognize some of the vegetable names that you have listed. Thank you for sharing! I really enjoyed this information too. jmscooper04, I agree. I always enjoy them when we go out to eat Chinese. Thanks for commenting. souleru, Thanks for commenting. 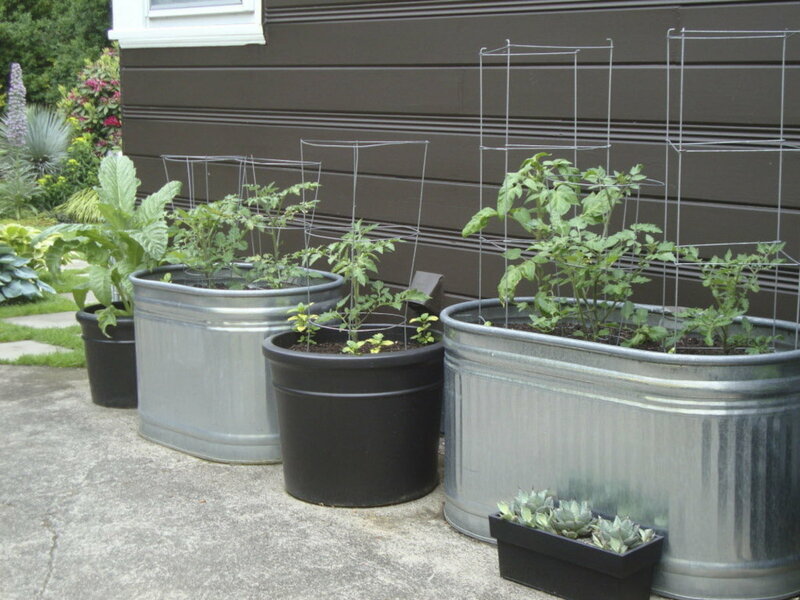 Just a suggestion, but you could try growing a few in containers. Raydfernandez, I know the bamboo isn't hardy here, but it is in parts of Florida I think. Thanks for commenting on the hub. Wooden Greenhouse, I'm surprised at the variety too. Now if only I could grow bamboo shoots and chestnuts here. Thanks for commenting. Nice hub on asian vegetables, ive not heard of them all before. Thanks for the info!